If commercial business owners are looking for excellence in metal roofing, they should hire the professionals at Legends Roofing for metal roof installation in Dallas, TX. For over 15 years, we have been providing metal roof installation and metal roof repair to the DFW area. We pride ourselves on delivering quality metal roofing services to commercial enterprises. We do this by using state-of-the-art tools and hiring roofers who are certified and trained to install and repair metal roofs. Call 214-321-3293 now to see how our great staff use their tools to build you a better roof today. Metal roofing offers many benefits to commercial business owners. 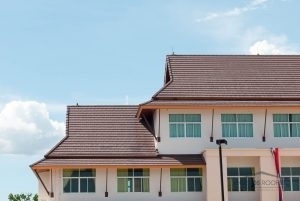 There are plenty of benefits to reap from commercial metal roof installation. The biggest benefit is lower energy use inside your business and great storm damage defense. The reflective surface of a metal roof will direct sunlight and UV rays away from your building, letting you keep the room temperature inside just right at all times. The hard surface is also a great barrier beneath hail damage and ice build up – meaning less chance impact hail damage and less chance of leakages from ice dams. With a large selection of phenomenal metal roofing materials, you will be able to find a roof that works for you. Some of our recommendations include screw-down panel, standing seam, and stone coated steel. These are great materials that bring style, comfort, and long-lasting protection to commercial buildings. Whichever one you choose for your metal roof installation service, know that you are getting a roof that will bring you years and years of safety from the outside elements and inclement weather. Interested in our metal roof installation for your Dallas, TX home? Contact one of our special roofing consultants. When you need metal roof services in Dallas, TX, look no further than the roofing contractors at Legends Roofing! Whether you need a metal roof installation or repair, our roofers are here to offer high-quality services. We know that dealing with roofing services can be a little stressful, so our roofers offer appointment times that are convenient for you, are within your budget, and give you a better peace of mind. Let the Legends Roofing roofers take care of your metal roof installation. Get started by calling 214-321-3293 today! Updated on August 4, 2017 at 1:39 pm by Legends Roofing.